Download "Annankatu 18, P.O. Box 400, FI-00121 Helsinki, Finland Tel. +358 9 686180 Fax +358 9 68618210 echa.europa.eu"
7 Work Programme Presentation of the European Chemicals Agency Established on 1 June 2007, the European Chemicals Agency (ECHA) is at the centre of the new regulatory system for chemicals in the European Union (EU), set out in Regulation (EC) No 1907/2006 of the European Parliament and the Council concerning the Registration, Evaluation, Authorisation and Restriction of Chemicals (REACH). At the beginning of 2009, REACH was complemented by the Regulation on Classification, Labelling and Packaging of substances and mixtures (CLP Regulation (EC) No 1272/2008 of the European Parliament and the Council). These legislative acts are applicable in all EU Member States without the need for transposition into national law. The purpose of the REACH system is to ensure a high level of protection of human health and of the environment; to promote alternative methods to animal testing to assess the hazards of chemicals; to facilitate the free circulation of substances within the single market; and to enhance competitiveness and innovation. In practical terms, the new regime is expected to close a knowledge gap in relation to so called phase-in substances placed on the European market; to speed up the placing of safe and innovative chemicals on the market; and to make the risk management of these substances more efficient in particular by shifting the burden of proof for identifying and controlling risks from authorities to companies. The successful implementation of REACH requires a well-functioning Agency, capable of delivering independent and high-quality science-based opinions within strict legal deadlines, as well as ensuring that the operational aspects of the legislation function smoothly. However, the efficient operation of REACH also depends on ECHA s institutional partners, in particular the Member States of the EU, the European Parliament and the European Commission ( Commission ) on the one hand, and on industry to implement the regulation properly, on the other. 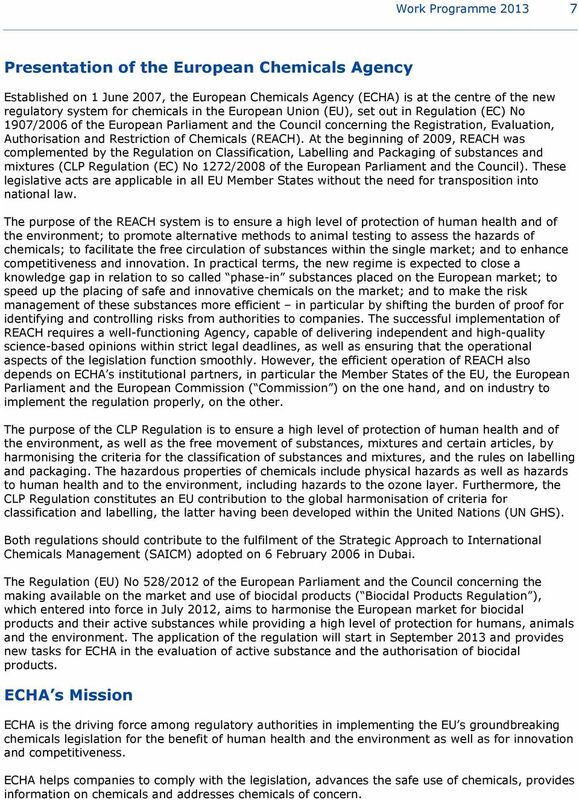 The purpose of the CLP Regulation is to ensure a high level of protection of human health and of the environment, as well as the free movement of substances, mixtures and certain articles, by harmonising the criteria for the classification of substances and mixtures, and the rules on labelling and packaging. The hazardous properties of chemicals include physical hazards as well as hazards to human health and to the environment, including hazards to the ozone layer. Furthermore, the CLP Regulation constitutes an EU contribution to the global harmonisation of criteria for classification and labelling, the latter having been developed within the United Nations (UN GHS). Both regulations should contribute to the fulfilment of the Strategic Approach to International Chemicals Management (SAICM) adopted on 6 February 2006 in Dubai. The Regulation (EU) No 528/2012 of the European Parliament and the Council concerning the making available on the market and use of biocidal products ( Biocidal Products Regulation ), which entered into force in July 2012, aims to harmonise the European market for biocidal products and their active substances while providing a high level of protection for humans, animals and the environment. The application of the regulation will start in September 2013 and provides new tasks for ECHA in the evaluation of active substance and the authorisation of biocidal products. ECHA s Mission ECHA is the driving force among regulatory authorities in implementing the EU s groundbreaking chemicals legislation for the benefit of human health and the environment as well as for innovation and competitiveness. ECHA helps companies to comply with the legislation, advances the safe use of chemicals, provides information on chemicals and addresses chemicals of concern. 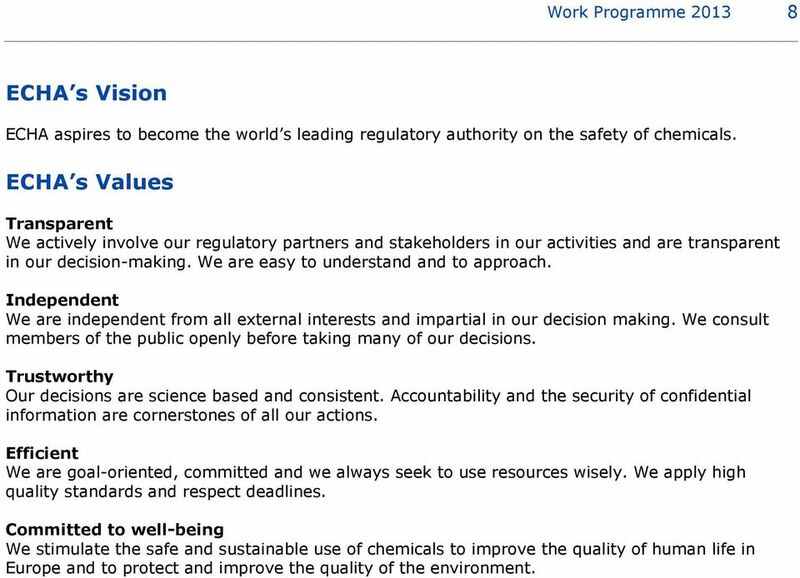 8 Work Programme ECHA s Vision ECHA aspires to become the world s leading regulatory authority on the safety of chemicals. ECHA s Values Transparent We actively involve our regulatory partners and stakeholders in our activities and are transparent in our decision-making. We are easy to understand and to approach. Independent We are independent from all external interests and impartial in our decision making. We consult members of the public openly before taking many of our decisions. Trustworthy Our decisions are science based and consistent. Accountability and the security of confidential information are cornerstones of all our actions. Efficient We are goal-oriented, committed and we always seek to use resources wisely. We apply high quality standards and respect deadlines. Committed to well-being We stimulate the safe and sustainable use of chemicals to improve the quality of human life in Europe and to protect and improve the quality of the environment. 9 Work Programme Introduction This Work Programme outlines the European Chemicals Agency s objectives for 2013, which will be its sixth year of activity. 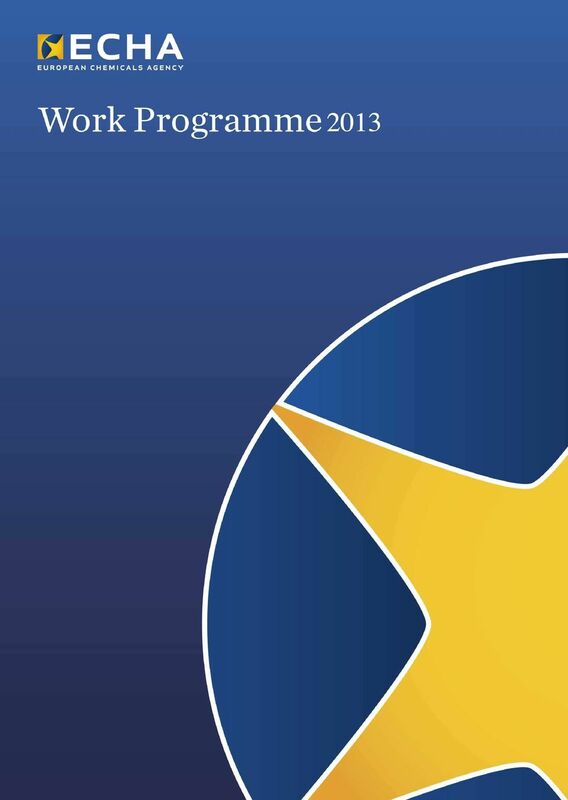 The Multi-Annual Work Programme , adopted in June 2012 by the ECHA Management Board after a public consultation, provides the basis for this annual Work Programme. The structure of the Work Programme follows ECHA s Activity Based Management approach and is divided into 17 Activities. Each Activity has a set of objectives and outputs, as well as performance indicators, through which achievements can be followed up. A new strategic approach has been adopted by ECHA s Management Board in the Multi- Annual Work Programme and will provide a steer to the Agency in prioritisation and resource allocation. The annual Work Programme objectives will derive from the strategic approach. There are four strategic aims: 1. Maximise the availability of high quality data to enable the safe manufacture and use of chemicals. 2. Mobilise authorities to use data intelligently to identify and address chemicals of concern. 3. Address the scientific challenges by serving as a hub for scientific and regulatory capacity building of Member States, European institutions and other actors. 4. Embrace current and new legislative tasks efficiently and effectively, while adapting to upcoming resource constraints. The new Biocidal Products Regulation will be applied from 1 September The regulation provides additional tasks and resources for ECHA in particular, the review of applications for authorisation of certain biocidal products. ECHA will continue to prepare itself to be ready to implement the regulation in September The complete handover of the Biocides activity from the Commission's Joint Research Centre (JRC) will be done by the end of A recast of the PIC Regulation 1, which concerns the export and import of dangerous chemicals, will also bring new tasks to ECHA. In 2013, ECHA will work towards ensuring good progress in the preparatory activities so that the Agency will become operational for the new PIC tasks by March 2014, after the handover of the activities from the Commission's JRC. The final ECHA budget and the establishment plan for human resources will be adopted in December 2012 by its Management Board, following the final adoption of the general budget of the European Union by the Budgetary Authority (European Council and Parliament). Should the total revenue or authorised staff figures differ significantly from the current estimates, the Work Programme will be adjusted accordingly. 1 Regulation (EU) 649/2012 of the European Parliament and of the Council concerning the export and import of hazardous chemicals (recast). 10 Work Programme ECHA s Challenges and Priorities for 2013 The four strategic aims will provide a steer on how to face the challenges of the different Activities described in this Work Programme. 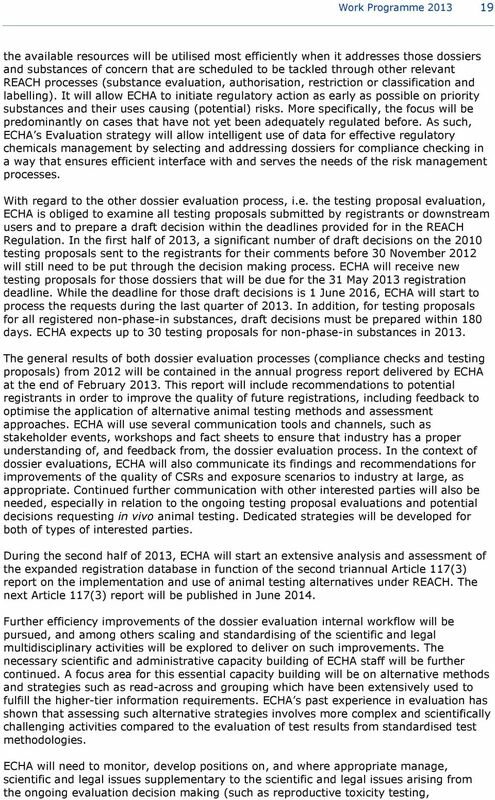 The year 2013 will be a peak year in several ways: the second registration deadline and its implications, a peak in compliance checks to reach the 5 % target, the steadily increasing number of substance evaluations, the first authorisation applications and the continuously high workload related to proposals for harmonised classification and labelling. In addition, the Biocidal Products Regulation will become operational on 1 September 2013 and the biocides activities will have to be integrated with other activities in order to maximise the synergies. The second registration deadline 1 under the REACH Regulation will require industry to submit thousands of registration dossiers. In addition to merely processing the registrations, the number of inquiries, helpdesk enquiries, data sharing disputes, confidentiality requests and appeals will also increase. 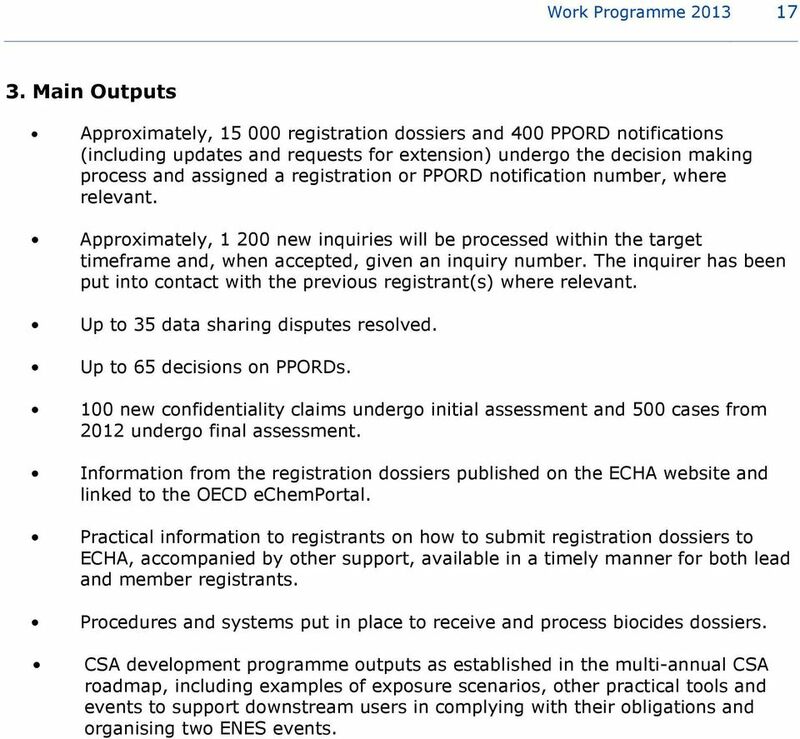 The high number of dossier submissions will also increase the need to publish information on the registered substances. Moreover, ECHA will provide support to lead and member registrants to assist them in preparing high quality technical dossiers and chemical safety reports that meet the legal requirements and contribute to achieving its strategic aims. Compliance checks are the main vehicle for checking the compliance of dossiers with the REACH Regulation thus pursuing the strategic aim of maximising high quality data. Evaluation targets will remain high in Evaluation, together with industry s own responsibility, should instil confidence in the EU citizens that industries registration dossiers are of a good quality and meet the requirements. ECHA willl ensure intelligent use of the data submitted by industry for effective regulatory chemicals management by selecting and addressing dossiers for compliance check in a way that ensures efficient interface with the risk management processes. ECHA has committed itself to reaching the 5 % target of compliance checks on the highest tonnage band by the end of A high share of targeted compliance checks should help achieving the ambitious target. Furthermore, substance evaluation should reach a cruising speed. Achieving final decisions on all testing proposals for the 2010 deadline and the follow-up of previous decisions require the action of ECHA and the Member States. In the area of Risk Management, the identification of substances and the most appropriate risk management by MSCAs and the Commission/ECHA will continue in pursuit of using the data intelligently and addressing chemicals of concern. This will gradually lead to more proposals for restrictions and more substances placed on the Authorisation List. Moreover, handling authorisation applications, as a new process, will be challenging as the number of applications will increase. 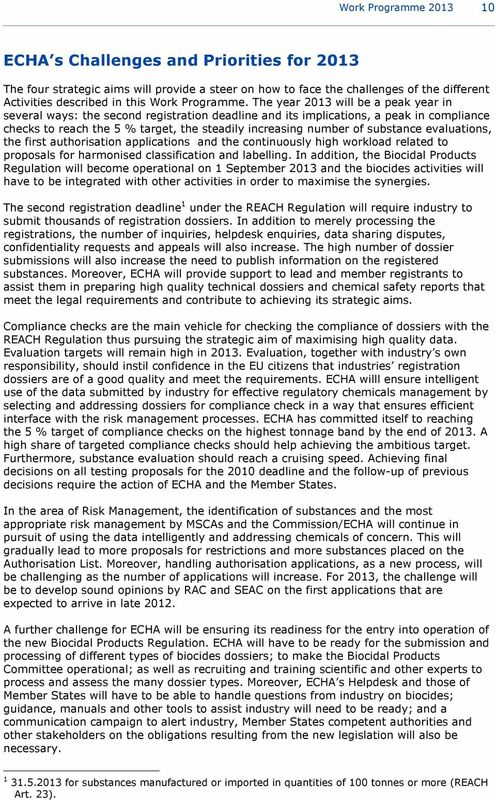 For 2013, the challenge will be to develop sound opinions by RAC and SEAC on the first applications that are expected to arrive in late A further challenge for ECHA will be ensuring its readiness for the entry into operation of the new Biocidal Products Regulation. ECHA will have to be ready for the submission and processing of different types of biocides dossiers; to make the Biocidal Products Committee operational; as well as recruiting and training scientific and other experts to process and assess the many dossier types. Moreover, ECHA s Helpdesk and those of Member States will have to be able to handle questions from industry on biocides; guidance, manuals and other tools to assist industry will need to be ready; and a communication campaign to alert industry, Member States competent authorities and other stakeholders on the obligations resulting from the new legislation will also be necessary for substances manufactured or imported in quantities of 100 tonnes or more (REACH Art. 23). 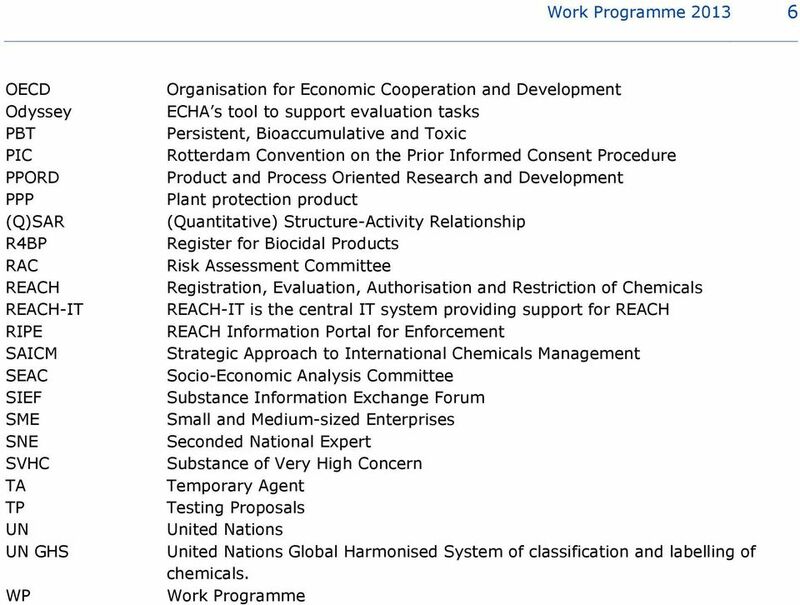 11 Work Programme Lastly, it will be a challenge to provide scientific expertise to the Commission in its further development of the chemicals management policy, in particular as a follow-up to the 2012 review of REACH. This derives from ECHA s aspiration to become a hub for scientific and regulatory knowledge building of the Member States, European institutions and other actors, and to use this new knowledge to improve the implementation of the chemicals legislation. Although the level of activity and resource needs will be at its peak in 2013, the austerity measures with regard to the EU budget demand savings in both human and financial resources in all EU bodies. So, ECHA is likely to be in a situation where, in addition to maximising the synergies between different processes and legislations, it needs to find further efficiencies, cutting back or slowing down activities that are not mandatory or where legislation does not provide fixed deadlines. 12 Work Programme Implementation of the Regulatory Processes Activity 1: Registration, Data-sharing and Dissemination 1. Main Challenges in 2013 Registration and dossier submissions Registration REACH is based on the principle that the responsibility for the identification and management of risks from a substance lies with the company that manufactures, imports, markets, or uses the substance. Companies that manufacture or import substances in quantities of one tonne or more per year need to demonstrate that they have assumed that responsibility by means of a registration dossier, which is submitted to ECHA. After receiving the registration dossier, ECHA verifies the completeness of the information provided and the payment of the registration fee, before assigning a registration number. The year 2013 is the year of the second registration deadline for phase-in substances 2 that benefit from a transitional regime under REACH. Companies that manufacture or import substances in quantities of more than 100 tonnes per year must submit their registration dossier to ECHA on 31 May 2013 at the latest. 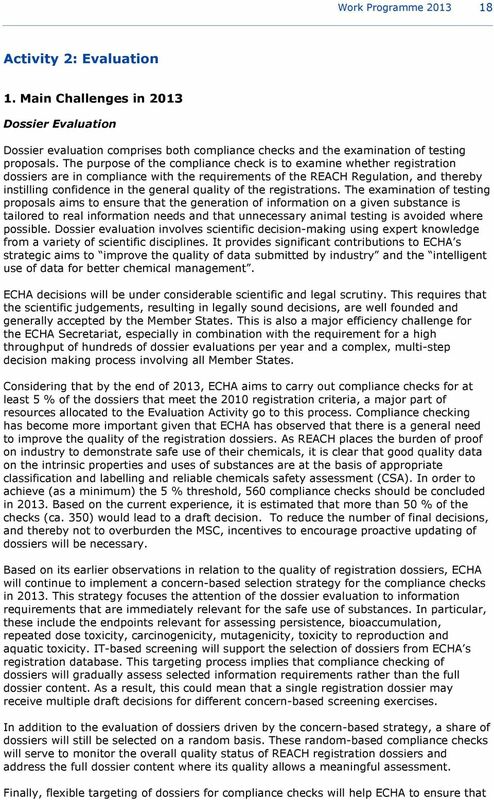 Based on surveys carried out in cooperation with industry in 2012, ECHA is prepared for three different scenarios, the planning baseline being approximately dossiers due by the registration deadline and approximately registration dossiers of other types, like new substances or updates. It is assumed that most of the registrations will arrive in two peaks, lead registrants submitting at the end of the first quarter to benefit from a shorter deadline for completeness checks by ECHA, and member registrants submitting closer to the deadline. Building on the experience gained in 2010 from the first registration deadline, ECHA has put in place a plan to handle the workload peaks, relying on existing and interim staff trained for the purposes of temporary redeployment. This is to ensure that the dossiers will undergo the completeness check in an efficient and timely manner. However, focusing resources on the registration process may have an impact on other tasks, such as dissemination, which are likely to be postponed to the last quarter when all registration numbers will have been assigned. ECHA is committed to providing well-targeted submission support to the registrants in the final months preceding the second registration deadline in order for them to meet their legal obligations and submit high quality dossiers. In order to be up-to date on the industry progress and to be able to react promptly to any potential issues that might endanger registration, ECHA will actively participate in the work of the Directors Contact Group (DCG) which had played an important role in achieving a successful result in the 2010 registration deadline. For the 2013 deadline, the DCG is paying specific attention to outreach activities towards SMEs via European and national authorities and associations. 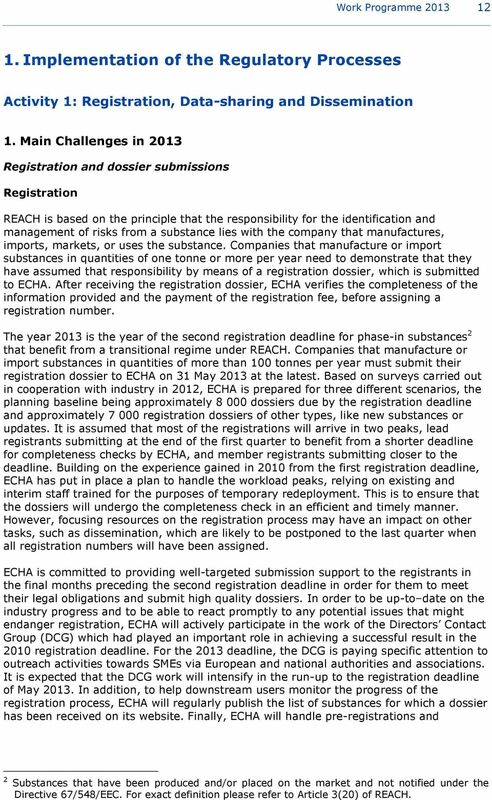 It is expected that the DCG work will intensify in the run-up to the registration deadline of May In addition, to help downstream users monitor the progress of the registration process, ECHA will regularly publish the list of substances for which a dossier has been received on its website. Finally, ECHA will handle pre-registrations and 2 Substances that have been produced and/or placed on the market and not notified under the Directive 67/548/EEC. For exact definition please refer to Article 3(20) of REACH. 13 Work Programme registrations from Croatia 3, in accordance with the transitional arrangements foreseen in their Treaty of Accession to the EU. Finally, with increased force the Agency will continue its activities on checking the validity of the registration dossiers received for substances used as intermediates to verify whether the uses specified are in line with the definition of intermediate use and that strictly controlled conditions are applied. Computational tools and methods Registration is only the first step in the chain of events leading to an increasingly safe use of chemicals as foreseen in REACH. Therefore, ECHA wants to encourage the registrants to continuously improve their registration dossiers as they gather new information on their substances. To this end, ECHA will continue developing screening methods and automated tools to identify shortcomings in the dossiers. The findings from screening, together with best practices, will be communicated to registrants with the aim of stimulating spontaneous updating. 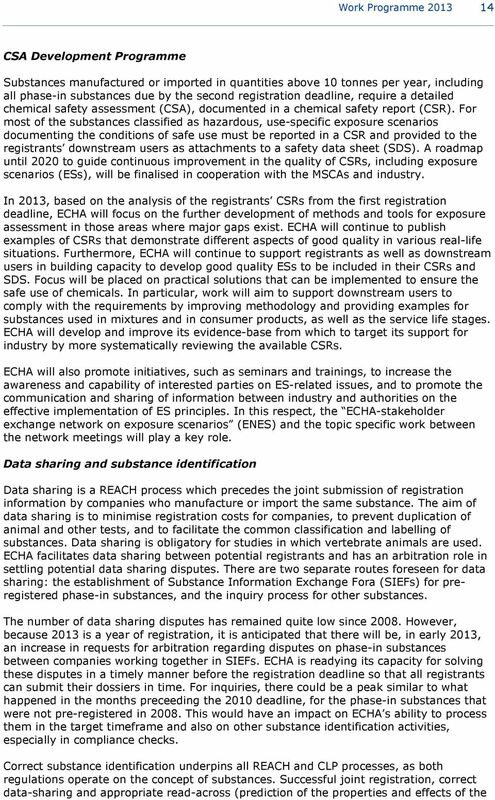 The second registration deadline means that in 2013 there will be a significant stepwise increase in the content of ECHA s database on substances. The Agency will ensure intelligent use of this data for effective regulatory chemicals management by progressively increasing its data mining and data analysis capacity, subject to availibility of resources, in order to accurately identify information to best serve the interest of other REACH and CLP processes, such as targeted evaluation and risk management. Other types of dossier submissions With a view to stimulating European innovation, companies can request temporary exemption of registration obligations for substances used in product and process oriented research and development (so called PPORD notifications ). As the number of PPORD notifications is lower than expected, ECHA intends to make this possibility better known to companies. The first PPORD exemptions expire in 2013, at which time assessment of potential requests for their prolongation will begin. 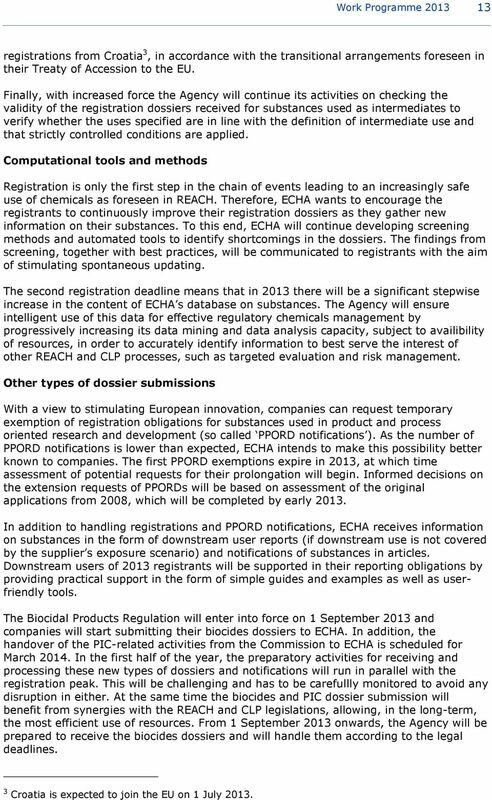 Informed decisions on the extension requests of PPORDs will be based on assessment of the original applications from 2008, which will be completed by early In addition to handling registrations and PPORD notifications, ECHA receives information on substances in the form of downstream user reports (if downstream use is not covered by the supplier s exposure scenario) and notifications of substances in articles. Downstream users of 2013 registrants will be supported in their reporting obligations by providing practical support in the form of simple guides and examples as well as userfriendly tools. 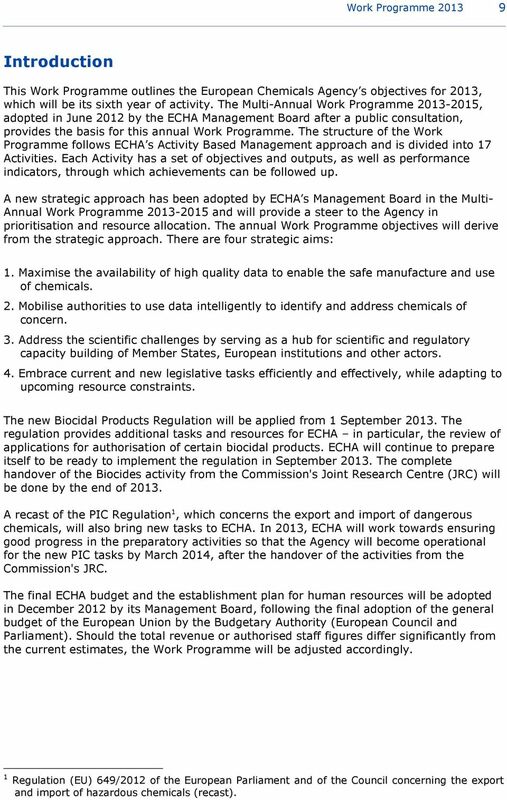 The Biocidal Products Regulation will enter into force on 1 September 2013 and companies will start submitting their biocides dossiers to ECHA. In addition, the handover of the PIC-related activities from the Commission to ECHA is scheduled for March In the first half of the year, the preparatory activities for receiving and processing these new types of dossiers and notifications will run in parallel with the registration peak. This will be challenging and has to be carefullly monitored to avoid any disruption in either. At the same time the biocides and PIC dossier submission will benefit from synergies with the REACH and CLP legislations, allowing, in the long-term, the most efficient use of resources. From 1 September 2013 onwards, the Agency will be prepared to receive the biocides dossiers and will handle them according to the legal deadlines. 3 Croatia is expected to join the EU on 1 July 2013. 15 Work Programme substance from those of another substance within the same substance category) are only possible if all parties have a clear understanding of substance identification under REACH. 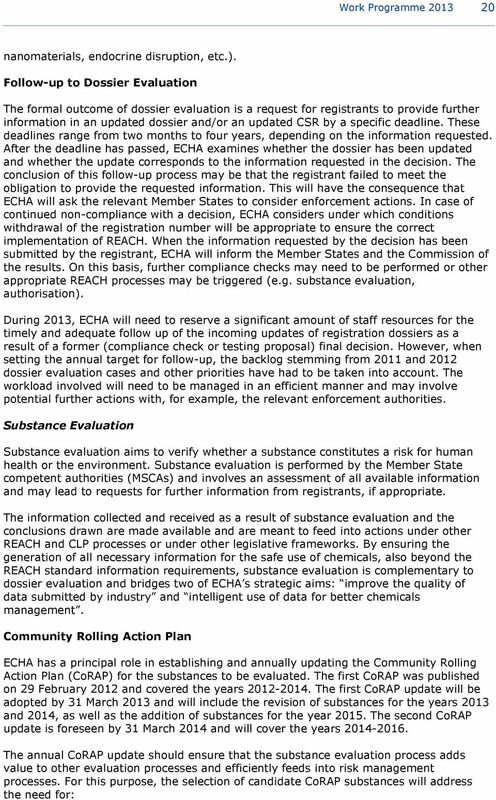 Therefore, ECHA will continue its efforts to clarify the substance identification requirements and the substance sameness concept through discussions with interested parties, within or outside the regulatory processes, with a view to initiating an update of the guidance for identification and naming of substances well ahead of the last registration deadline. ECHA also intends, subject to availability of resources, to conduct a feasibility study on giving solid regulatory status to chemicals for which it has assigned list numbers (i.e. to substances for which there was no EC number available). Dissemination electronic public access to information ECHA is required to make information on registered substances publicly available on its website. This activity is expected to have a positive impact on health and environmental protection both in Europe and worldwide, as everyone has the possibility to consult information on the chemicals they use. Further to the second wave of registrations in 2013, ECHA will have received and stored information from an estimated additional registration dossiers for substances manufactured or imported in quantities of tonnes per year. ECHA will start publishing the information from these dossiers in September 2013, once they have received a registration number. Activities for developing the website as a central point of access for all information contained in ECHA databases on a given substance will continue. ECHA will analyse the feedback from the stakeholders collected in a survey during 2012, with a view to prioritising the forthcoming improvements. Specifically, the needs of the general public, an audience that is not familiar with the technical format currently used for publication, will be taken into consideration. 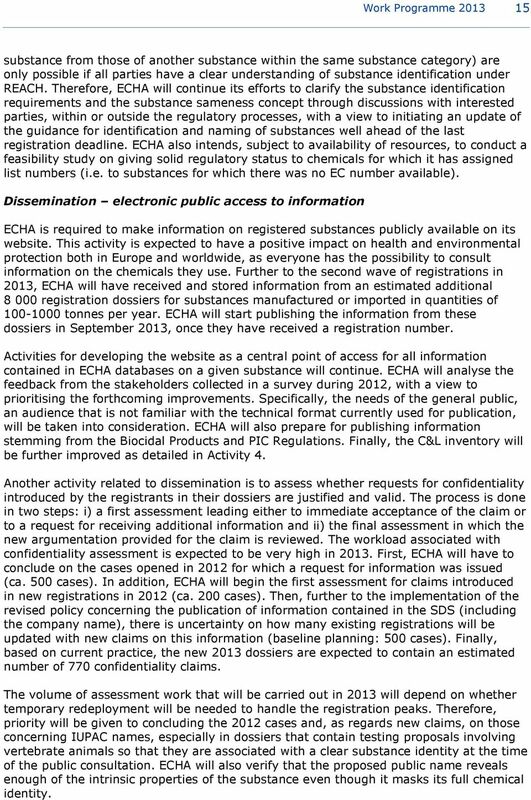 ECHA will also prepare for publishing information stemming from the Biocidal Products and PIC Regulations. Finally, the C&L inventory will be further improved as detailed in Activity 4. Another activity related to dissemination is to assess whether requests for confidentiality introduced by the registrants in their dossiers are justified and valid. The process is done in two steps: i) a first assessment leading either to immediate acceptance of the claim or to a request for receiving additional information and ii) the final assessment in which the new argumentation provided for the claim is reviewed. The workload associated with confidentiality assessment is expected to be very high in First, ECHA will have to conclude on the cases opened in 2012 for which a request for information was issued (ca. 500 cases). 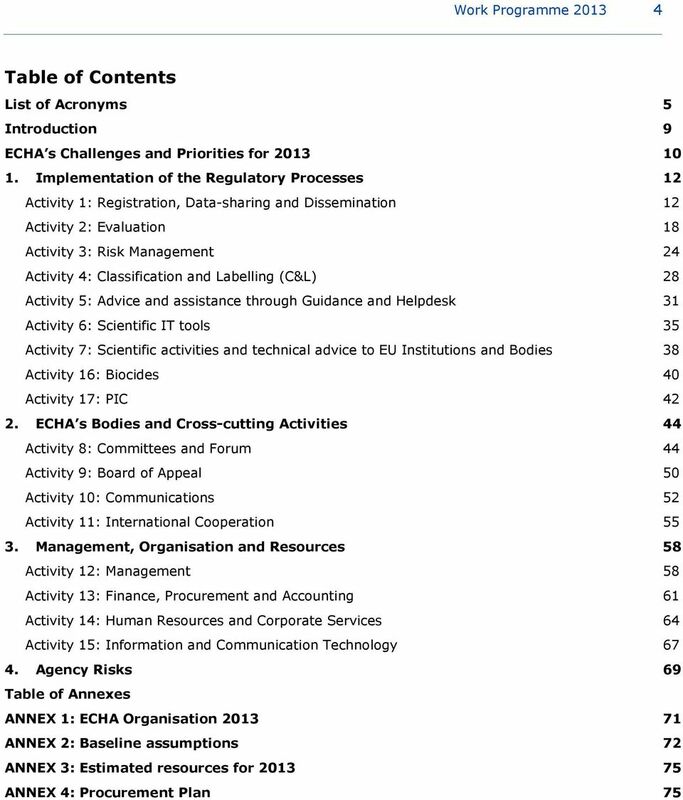 In addition, ECHA will begin the first assessment for claims introduced in new registrations in 2012 (ca. 200 cases). Then, further to the implementation of the revised policy concerning the publication of information contained in the SDS (including the company name), there is uncertainty on how many existing registrations will be updated with new claims on this information (baseline planning: 500 cases). Finally, based on current practice, the new 2013 dossiers are expected to contain an estimated number of 770 confidentiality claims. The volume of assessment work that will be carried out in 2013 will depend on whether temporary redeployment will be needed to handle the registration peaks. Therefore, priority will be given to concluding the 2012 cases and, as regards new claims, on those concerning IUPAC names, especially in dossiers that contain testing proposals involving vertebrate animals so that they are associated with a clear substance identity at the time of the public consultation. ECHA will also verify that the proposed public name reveals enough of the intrinsic properties of the substance even though it masks its full chemical identity. 16 Work Programme Objectives and Indicators Objectives 1. All dossiers, inquiries and data sharing disputes undergo the required checks and the respective decisions are given, and confidentiality claims assessed, according to the standard procedures, ensuring timely identification of problematic dossiers to stimulate their updates and have an impact on the data quality, and within the legal deadlines or internal targets set. 2. Decisions are well justified and of a high technical and scientific quality. 3. Stakeholders and the public have an easy access to information from all dossiers of registered substances and C&L notifications within a reasonable time after the registration/submission of notification. 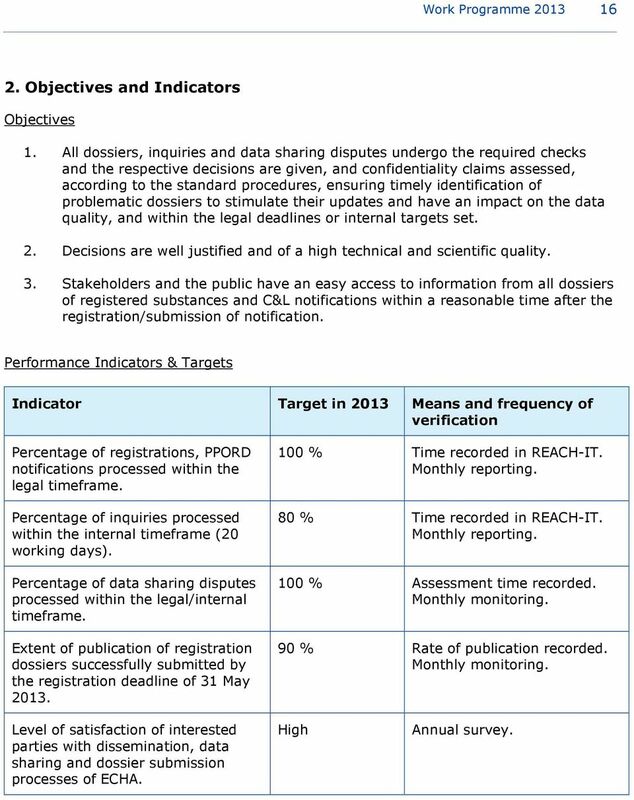 Performance Indicators & Targets Indicator Target in 2013 Means and frequency of verification Percentage of registrations, PPORD notifications processed within the legal timeframe. Percentage of inquiries processed within the internal timeframe (20 working days). Percentage of data sharing disputes processed within the legal/internal timeframe. Extent of publication of registration dossiers successfully submitted by the registration deadline of 31 May % Time recorded in REACH-IT. Monthly reporting. 80 % Time recorded in REACH-IT. Monthly reporting. 100 % Assessment time recorded. Monthly monitoring. 90 % Rate of publication recorded. Monthly monitoring. Level of satisfaction of interested parties with dissemination, data sharing and dossier submission processes of ECHA. High Annual survey. 17 Work Programme Main Outputs Approximately, registration dossiers and 400 PPORD notifications (including updates and requests for extension) undergo the decision making process and assigned a registration or PPORD notification number, where relevant. Approximately, new inquiries will be processed within the target timeframe and, when accepted, given an inquiry number. The inquirer has been put into contact with the previous registrant(s) where relevant. Up to 35 data sharing disputes resolved. Up to 65 decisions on PPORDs. 100 new confidentiality claims undergo initial assessment and 500 cases from 2012 undergo final assessment. 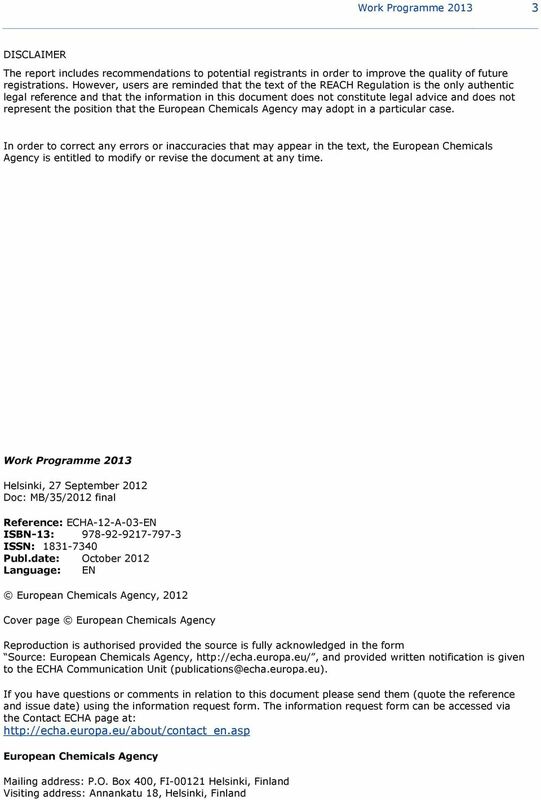 Information from the registration dossiers published on the ECHA website and linked to the OECD echemportal. Practical information to registrants on how to submit registration dossiers to ECHA, accompanied by other support, available in a timely manner for both lead and member registrants. Procedures and systems put in place to receive and process biocides dossiers. CSA development programme outputs as established in the multi-annual CSA roadmap, including examples of exposure scenarios, other practical tools and events to support downstream users in complying with their obligations and organising two ENES events. 21 Work Programme the clarification of relevant risks for human health or the environment in order to decide on regulatory follow up actions; an assessment at EU and substance level, and in most of the cases the requirement of further information that cannot be requested under dossier evaluation. It is expected that the preparation of the second CoRAP update can continue to be based on selection criteria established by ECHA in collaboration with MSCAs in The foreseen evaluation turnover would require the identification of at least 40 new CoRAP substances per year. Candidate substances will be identified either by ECHA or the MSCAs on the basis of information obtained under dossier evaluation or other ECHA processes. ECHA will also coordinate the allocation of substances to MSCAs. The aim is to achieve an increasing and evenly distributed input of MSCAs in substance evaluation and to ensure an average number of ca substances evaluated per year. Substance evaluation process ECHA will act as a coordinator in the overall substance evaluation process. After the publication of the CoRAP update, MSCAs have 12 months to evaluate their substances and prepare draft decisions requesting further information to clarify the detected concern, where appropriate. 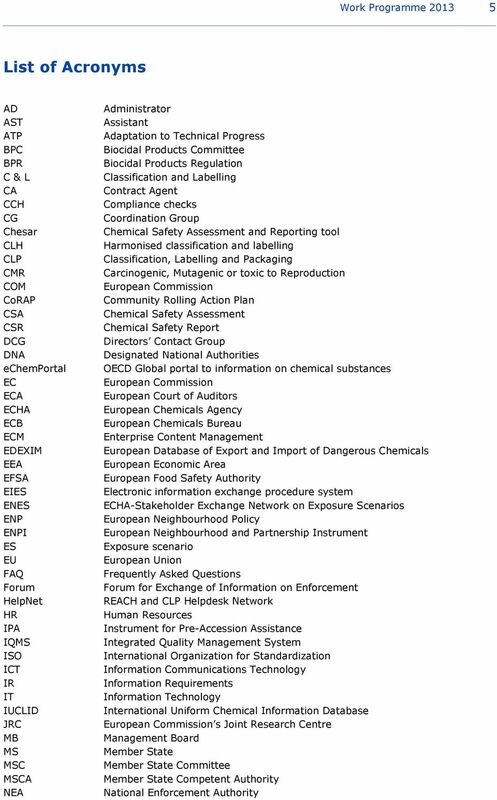 Based on the capacity indicated by MSCAs in 2012, it is estimated that 45 substances will be evaluated in At the same time, as a result of the evaluation of substances in 2012, ECHA will need to coordinate the decision making process of the first substance evaluation draft decisions and the conclusion of those evaluations that will not require a request for further information. Therefore, in 2013 ECHA will need to manage an increasing number of evaluations and final decisions generated under substance evaluation. ECHA will continue providing support to the substance evaluation performed by MSCAs. At the end of 2012, ECHA will agree a programme of supporting activities with the MSCAs, such as workshops, training sessions, practical guides and consistency screening, to be accomplished in Based on prior experience with the substance evaluation process, ECHA will continue to revise procedures, templates and practical guides (e.g. Q&A documents) and identify the best practices and need for harmonised policies. For this purpose, the organisation of at least one workshop and specific working groups, and the optimisation of communication means between MSCAs and ECHA will be a priority in Furthermore, ECHA will also provide advice to ensure harmonisation, consistency and legal soundness of decisions, evaluation reports and conclusions prepared by MSCAs. More in particular, ECHA will offer the possibility of a consistency screening of draft decisions before they are sent to registrants. It is estimated that for the approximated 45 substance evaluations this will result in up to 30 draft decisions, which may be screened by ECHA staff for legal and scientific consistency. Furthermore, ECHA will coordinate and provide administrative support to the decision making process. As the interlink between the evaluating MSCAs and multiple registrants, ECHA s administrative role in substance evaluation is quite challenging. The first experiences with this role will allow a start of the business analysis for the integration of the substance evaluation process within ECHA s enterprise content management system. German Competent Authority Experiences and Expectations from a Member State s Perspective Warszawa, 23-24 November 2011 Dr. Ann Bambauer Federal Office for Chemicals/Authorisation of Biocides Outline 1.